In this Today show story, a waitress’ good deed goes viral and she is rewarded with a scholarship—proof that kindness begets kindness. Waffle House waitress Evoni Williams felt she was just doing her job when she went the extra mile for an elderly customer and cut up some food on his plate. But by lending a hand and brightening the man’s day, she unknowingly brightened her own future — the 18-year-old’s kindness has now been rewarded with a $16,000 college scholarship. Williams, whose friends call her “Nini,” was on a busy shift at the Waffle House in La Marque, Texas, south of Houston, earlier this month when Adrian Charpentier, 78, mentioned his hands were in pain and giving him trouble. 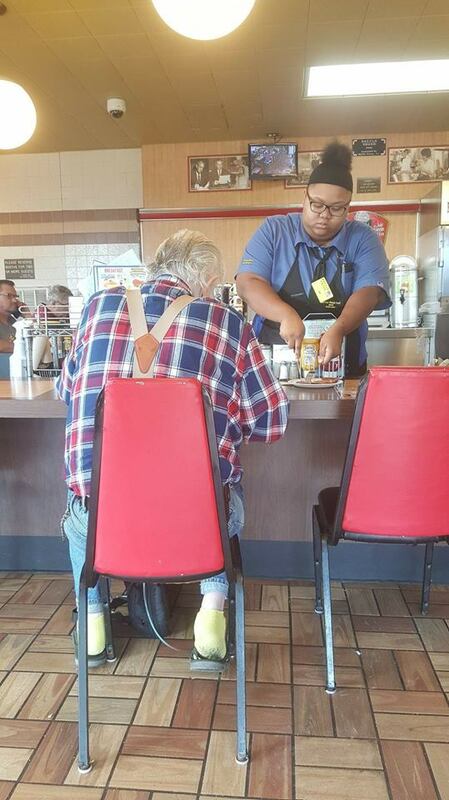 “If we could all be like this waitress & take time to offer a helping hand …” Wolf wrote in the caption. The photo went viral, with nearly 50,000 shares. Among those to notice were representatives from Texas Southern University, in Houston. On March 8, School officials gathered at the Waffle House to surprise Williams with a $16,000 check. The money can be used in $4,000 increments for each semester. Williams, who has been working at Waffle House to save up for college since she graduated high school, fought back tears as co-workers and superiors applauded. The city of La Marque also declared March 8 to be Evoni “Nini” Williams Day. Charpentier was there to see Williams’ proud moment. He told reporters he had recently been in the hospital for two days and his hands had been hurting. “I thanked her very much for it,” he said. Williams went back to work right after the ceremony, but her simple act of caring continues to resonate.